In an i-Lumia-nating press conference at MWC 2013 (sorry), Nokia has announced two new Windows Phone 8 handsets, the Nokia Lumia 520 and Nokia Lumia 720. Nokia's BFF relationship with Microsoft means that they will continue to beat the Windows Phone drum for some time to come, and the latest handsets will look to step up its challenge on Android and iOS. The phones slot in at the lower end of the Windows Phone range, which has proven to be a fecund area for Nokia's current Lumia crop. The Nokia Lumia 720's big selling point it its camera, with the Finnish giant offering up Carl Zeiss optic that is promising bright, clear pictures 'day or night'. There's also an HD front facing camera for those self portraits / video calls and the phone comes in, waity for it, FIVE colours. This veritable rainbow of phones will be priced at around 249 euros - which may well equate to a similar price in pounds. There is no news of a US launch. 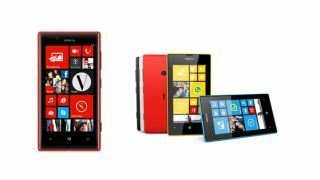 The phone will make its debut in Hong Kong, Vietnam and Singapore soon, and the Nokia Lumia 720 UK release date is likely to be between April and June 2013. On to the Nokia Lumia 520, which is offering up Windows Phone for a bargain-basement price of 139 euros. It has the same camera lens as the flagship Lumia 920 which perhaps speaks as much about the flagship as this offering. The Lumia 520 will also appear first in the Far East markets before heading over to European shores in Q2. Again, the US may face a longer wait.